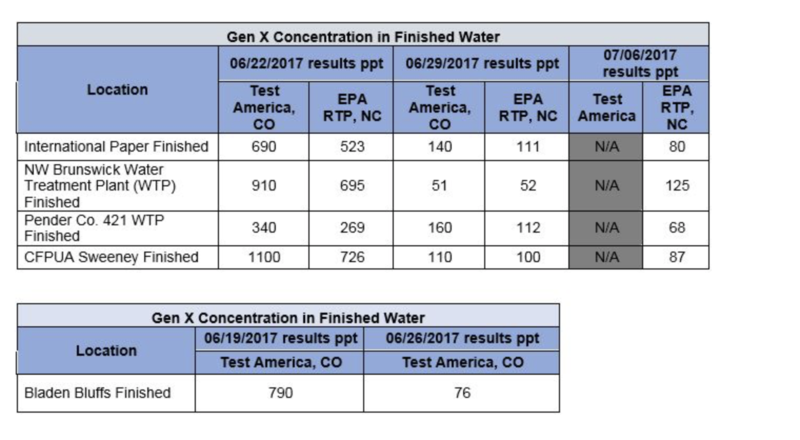 Initial sampling results of GenX in drinking water are in. They show that levels of the chemical far exceeded new — and drastically reduced — health department goals before Chemours stopped discharging most of its contaminated wastewater into the Cape Fear River. After water from the Cape Fear had been treated by public utilities, levels ranged from a high of 1,100 parts per trillion to as low as 269 ppt, but all above the NC Department of Health and Human Services’ new health goal. State health officials announced late this afternoon that it had revised its recommendation for GenX in drinking water to no more than 140 parts per trillion, particularly for vulnerable people such as bottle-fed infants. Originally, DHHS had said levels of GenX at 70,000 parts per trillion presented a “low risk” of health effects, based on Chemours data from 2013-2014. Although a safe level has not been established, the international threshold is 90 ppt; the EPA has set a “health advisory” for combined levels of PFOAs above 70 ppt. A cancer risk is not factored into the 140 ppt threshold. DHHS said there are no studies in humans on cancer related to GenX. Only one animal study is available. While it did show increases in some cancers of the pancreas, liver and testicles, the EPA has not identified a specific level of GenX that could be associated with an increased risk for cancer. Although there is no standard for GenX exposure in recreational use, the department also advised people not to swim in the area of the Cape Fear River near the Chemours plant in Fayetteville. DHHS said in a press release that after it consulted with the EPA, a different set of animal studies and an uncertainty factor lowered the level from 70,000 parts per trillion to 140 ppt. The department emphasized that this updated risk assessment “is not final” and is likely to be updated when new information becomes available or the EPA sets standards. When Chemours stopped discharging most of its wastewater into the Cape Fear, the levels dropped at the five public utilities: International Paper, Northwest Brunswick, Pender County No. 421, Cape Fear Public Utility Authority, Sweeney plant and Bladen Bluffs. At that point, only the Pender wastewater treatment plant reported levels in drinking water above 140 ppt. A well at Wrightsville Beach recorded levels of just 24–26 ppt. June 19 sampling results indicated that at the Chemours outfall — basically where the discharge leaves the facility — levels ranged from 21,760 ppt to 39,000 ppt. By June 26, those levels had dropped to 15,250 to 19,000. Those were still higher than expected. A subsequent DEQ inspection showed areas in the plant that were still discharging GenX. Those parts of the facility have since been shut down. Additional sampling occurred Wednesday and Thursday, although the results aren’t in. DEQ will also sample on July 17 and 24. GenX, used in the manufacture of Teflon and other non-stick coatings, is an emerging contaminant. That means it has not been independently tested for safety; nor is it regulated. Since this story came out our governor wrote a letter to Scott Pruitt blaming him saying that NC cannot regulate these compounds until EPA sets a standard. I know Opie is a politician and all – and I know this gives him a shot at Pruitt – fine, but I hope no one believes NC does not have the authority under the Clean Water Act to regulate this chemical! In fact, DEQ has a duty and has regulated hundreds of chemicals under the permitting program even when there was no standard. I mean – this is nuts. That is precisely why deq has toxicologists working for it. Something else is crazy – why is deq saying DuPont/Chemours disclosed their discharge of these compounds (thereby shielding them from enforcement or liability) when everyone who has looked at the prior applications say that no such disclosure was made? There must be a reason Gov Eudy does not want to regulate this now or that he wants to help Chemours. They have slow-walked this from the very beginning. If you ask me (which no one has) there is something very fishy going on here.